Over the past few months, I’ve scoured the internet and visited nearly every local bike shop, sometimes more than once shopping for my first road bike. After a long search and several test rides, I was overwhelmed by more brands, models, and component sets than I ever imagined possible. Initially, I was looking at the Raleigh Revenio 3.0, Felt Z85, and the Giant Defy 1, but after visiting River Market Cyclery and test riding a Cannondale CAAD10 5, I was sold on the Cannondale brand. 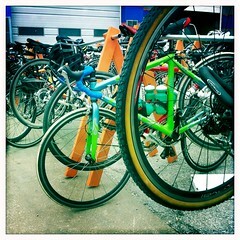 After a bit more searching, I found a 2010 Cannondale CAAD9 4 at Leawood Bicycles that was just my size. Since it was a 2010, it was also on sale for a great price. I went home, slept on it, and the next day made up my mind. The CAAD9 is the predecessor to the CAAD10 and was last Cannondale bicycle to be handmade in the United States. I also liked the CAAD9 4, because it was equipped with a full SRAM Rival groupset, including a carbon crank. I bought the bike on August 6. As of today, August 23, I’ve put just over 100 miles on it. It’s a great, responsive ride, though I’m still getting used to the firmer, smaller road saddle. I definitely don’t leave home without my biking shorts on. The CAAD9 has more of a racing geometry, so I’m taking it in today to have the stem flipped, so the my riding position will be a little more relaxed and comfortable. 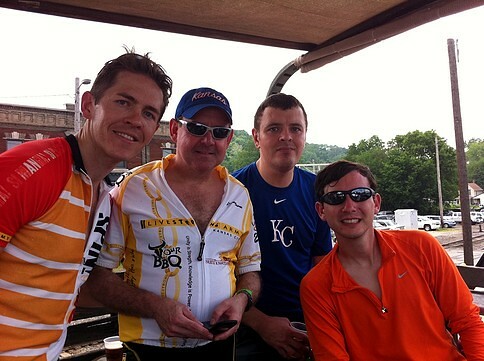 On Sunday, May 22, some friends and I participated in Kansas City’s Tour de Brew 30-mile ride. This is my second organized ride and my longest consecutive ride by 10-miles. View route GPS. The ride started and finished at Knuckleheads Saloon, in the Northeast Industrial District of Kansas City. Knuckleheads is definitely unique. It lives up to the images one would conjure up thinking about a saloon in the 1940’s. We started off on the 30-mile ride at 9:00 am and returned just after 12:30 pm. We looped through downtown, the Crossroads District, midtown and the Plaza, before making our first stop for a mini-gelato at SPIN! Pizza. We refilled quickly and were on our way south through some beautiful Plaza and Brookside neighborhoods. We rode on to Family Bicycles at 74th and Wornall where we made another pit stop, before turning around to finish the route back. 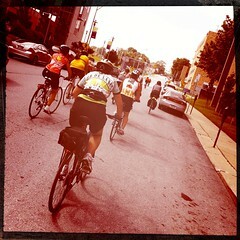 Seasoned cyclists are a courteous bunch. It’s common for someone to yell out, “car back,” when they notice a car approaching from behind. When approaching a stop sign, they yell “clear right, clear left,” to signal nearby cyclists it’s safe to proceed through the intersection. I enjoyed getting to see parts of the city that I wouldn’t have otherwise explored. Cycling is an experience like no other, you get a feel for neighborhoods, people, places, and best of all fresh air. Next time you’re thinking of buying a home, bike the neighborhood for a more intimate perspective of the people, places, and things.